I’ll admit that I attended the Mindpower meeting in February with some skepticism. From my perspective, however, Mindpower hit it right on the nose. They had listened incredibly well and creatively packaged what they heard into a concept that I believe reflects honestly who we are – at least who we want to be. I can’t image that anyone who knows me well is particularly surprised that I hold this perspective. This has been my personal “branding” for years. As I write this perspective, I’m traveling home from leading a retreat I titled “A Passionate Life; a Wholistic Peace.” While I often fall way short of my ideals, I believe that peacemaking, in its broadest sense, is at the heart of Jesus’ life and message. Do I have concerns? Yes. 1. I wish there could be a bit more nuance in the healing concept. First, in terms of reciprocity. We are not only helping to heal the world, but those acts – and the world’s citizens – are helping to heal us, too. Authentic peace-making is as much about our own salvation as it is about helping others. Secondly, I wish there were a way to clearly but simply say that it is God who does the healing. We are only the instruments. 2. We have far to go in living out this message within our own walls. I acknowledge a few relationships of my own that are in need of some work, and I know I am not alone. I worry about setting ourselves up to be something “out there” that we sometimes do very poorly here. 3. We need to emphasize clearly that what we mean is peace in a very broad sense. Anti-war, tree-hugging students (and I love them dearly) represent only a few of our peacemakers. Equally important are those who teach E.N.L., provide low-cost tax assistance, donate their meals, staff a restaurant to benefit LaCasa, support a hurting friend, plan an evening worship, etc. I have a wild brainstorm about how to make this commitment to “peace in its many forms” tangible. How about including a local peacemaking course in our new general education package? It could be a three hour, service-learning course that includes reading, journaling and regular meetings with a cohort and faculty sponsor. It might span two or more semesters; it might connect with one of the many non-profit organizations in the region; or it might help with schoolyard upkeep, assist older citizens, read to pre-schoolers, work with little league, walk with an immigrant family, visit prison-inmates, etc. I know this would be a huge undertaking – but so was S.S.T. – and I maintain that our local outreach and connections are equally important (perhaps more important) to our global-mindedness and our service orientation. And I suspect that in the long run, such a venture could transform our regional recruiting efforts. 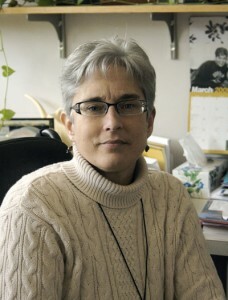 Carolyn Schrock-Shenk is an associate professor of peace, justice and conflict studies at Goshen College.